The Other Guys is not only a different type of Will Ferrell comedy, but it is also its own kind of buddy cop film. For that matter, The Other Guys is also not your average Mark Wahlberg film. The Other Guys was born from a bit that Will Ferrell was in the midst of on the Academy Awards stage when Ferrell came up short from insulting Wahlberg because of his brutish reputation. Immediately Ferrell’s writing partner and director Adam McKay thought they were on to something. Mark Wahlberg is the perfect straight man to Will Ferrell’s funny man. They only needed a script. Thankfully, their initial interest was in a comedic script that Kevin Smith would eventually make with Bruce Willis and Tracy Morgan — Cop Out. Instead they turned to an original idea from the manic minds of McKay and Ferrell. The plot was to take the buddy cop genre and turn it on its head. What McKay and Ferrell have done is exactly that. Although Eva Mendes is terrific in her role as Will Ferrell’s wife, she is frankly hardly in the movie. But, looking back on the long list of buddy cop films over time, the significant other role has always been small. What Eva Mendes does bring to the role is the root of a long-running joke throughout the entire film: What is Eva Mendes doing with Will Ferrell? Mark Wahlberg’s comedy timing is on full display during these scenes, when he doesn’t stop marveling at what Eva Mendes sees in Will Ferrell. Mark Wahlberg has always brought a sensitive layer to every role he plays and it works perfectly throughout The Other Guys. That sensitivity allows Wahlberg to be funny effortlessly. Think back to his role in Three Kings and you’ll see what I mean. The scene where he is trying to comfort his wife over the phone while the Iraqis are storming into his room to take him away is hilarious. 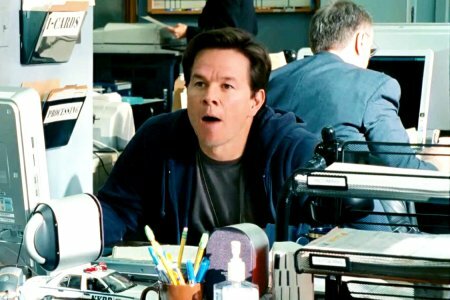 No one should be surprised that Mark Wahlberg is a natural at comedy. Ferrell and Wahlberg have terrific chemistry and we hope that The Other Guys is the first of many films starring the two. Most importantly, we also pray that this is not Mark Wahlberg’s last foray into comedy. As adept as he is with action, he smoothly navigates the treacherous waters of comedy. If Will Ferrell is the center of the comedy in The Other Guys, than Mark Wahlberg is right there with him.